Literacy at this age is taught as part of a broader area: ‘Communication, Language and Literacy’, in preparation for reading and writing. At this age, speaking and listening play a big part in literacy sessions, so your child’s teacher will be reading aloud and the children will be encouraged to sing songs and rhymes and join in with stories. Your school will probably have a reading scheme, made up of books of different levels, and your child may start to bring books home to read. You will probably be given a ‘reading record’ book to note down your comments. Don’t be alarmed if some of the books have no words at first: encourage your child to tell the story by looking at the pictures. Your child will probably read individually with the teacher once a week, and also in small groups with other children, which is known as ‘guided reading’. Children will start forming letters by working on vertical lines and drawing anti-clockwise circles. They will be working on their own stories, based on books they are reading in class, and they will also put together information books. The classroom will have a role-play area, possibly a shop or cafe, and the children will use this to practise handwriting. Browse through all our Reception English worksheets, or look through our phonics games and activities for your beginner reader. Our Fabulous phonics pack is our complete guide to everything parents need to know about phonics in EYFS and KS1. 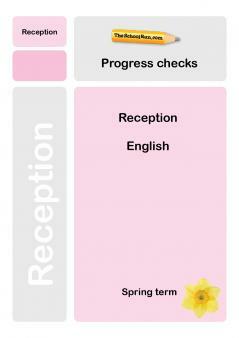 Check your Reception child's progress in English with our free Reception English Progress checks, three mini-tests for the autumn, spring and summer terms.